Clean the basil leaves using a damp cloth. Put the cloves of garlic in the mortar adding a pinch of rock salt. Start to crush the leaves and the garlic until obtaining a cream. Add another pinch of rock salt. Crush the mixture again until obtaining a mush. Add the pine nuts and crush. Add gradually the cheese with a spoon. Lastly, add the extra virgin olive oil, blend and the pesto is ready. For what it concerns the preparation of the lasagne, put a spoonful of béchamel on a Pyrex plate, add the first layer of egg pastry and cover it with another spoonful of béchamel. Add the pesto alla Genovese and then the buffalo ricotta. If the ricotta is too hard, dilute it with a little milk. Add some grated cheese. Repeat the procedure until obtaining at least 5 layers of lasagna. 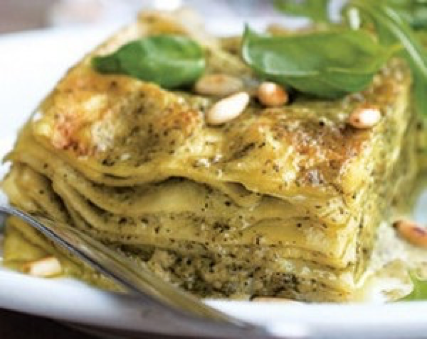 Lastly, cover the last layer of lasagna with just some béchamel and some pesto alla Genovese. Cottura : portate il forno a 180°C. Dopo 10 minuti infornate le lasagne e lasciatele cuocere per circa 40 min. Adjust the temperature of the oven to 180°C. After 10 Minutes put the lasagna in the oven and let it bake for about 40 Minutes.